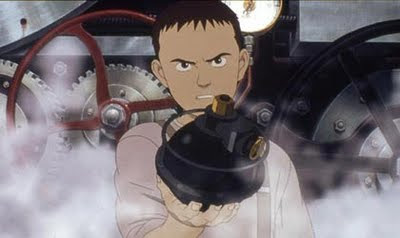 Outomo Katsuhiro’s Steamboy is the most expensive anime movie ever made. The director, who attained international fame when he adapted his manga Akira into perhaps the most famous animated movie of all time, has shifted gears significantly in the sixteen years between the two films, but they’re spiritually linked in more than one way. The most obvious is the character designs, which owe a lot to his style – Kaneda and Tetsuou are visible in Ray’s features, and his father’s appearance is not unlike Colonel Shikishima’s. But then you consider the dynamics of flight, the grim slapstick of human errors causing problems even in action sequences, and the fact that really, the plot is thin and meandering, but the strong action and powerfully evocative atmosphere of the setting leaves a distinctive mark on anyone who watches it. It is, however, much lighter. The plot, such as it is, is that young Ray Steam’s grandfather sends him a classic McGuffin – a little metal ball full of super-compressed steam. In the tradition of McGuffins, some bad guys want it, so there are some exciting chase scenes. A snobby rich girl is introduced, promising revelations and life-lessons that never actually come, and then we see the real plot: Ray’s father is developing advanced weapons, some other people (including his own father) disagree with him, and then they all have a scrap. And some very silly things ensue. It’s not a clever concept, but it’s a fairly clever film, with lots of great visual moments, be they precise animations of combustion engines or nice dynamic pans around some beautiful architecture, or just little details that make you smile. It’s steampunk through and through, with daft flying machines, robotic limbs and a bunch of slapdash references to real historical figures that can be totally anachronistic: the ‘alternate history’ flag can deal with that. It’s not sophisticated or original, but it’s loads of fun and it makes me smile, seeing London presented as an idealised, exotic location. Makes me very eager to see a film version of Mortal Engines, I must say.